In the world of conditioners, there are many distinct products to choose from. WEN by Chaz represents an interesting option for those hoping to improve their hair more naturally, but will it work for you? Here’s what you need to know about this increasingly popular cleansing conditioner. Many conditioner products stake their claim to fame on being unique. The WEN product line takes this a step further by offering a less complicated solution to hair care that relies on natural ingredients. WEN by Chaz is specifically designed to eliminate the need for intricate routines. Instead of having to wash with shampoos, apply conditioners and deep conditioners, use detanglers and follow up with leave-in conditioners, you can simply replace the entire ordeal with the WEN cleansing conditioner. Another nice aspect of this universal approach is that it’s designed to function equally well with different hair types. For instance, people with thick hair, curlier textures or hair loss can all expect similar benefits. If there’s one major characteristic that sets WEN apart from other options, it’s the line’s attention to subtle details. Unlike many hair care alternatives, these products aren’t made with animal testing, and they’re all manufactured in the United States. Those looking for something natural are sure to appreciate the fact that WEN entirely forgoes harsh chemicals. The sulfates that you’d find in almost every other hair cleaner are notably absent here. With blissfully short ingredient lists and a transparent approach to letting consumers know why they use each component, WEN’s creators seem set on permanently changing the hair care industry. WEN’s most obvious advantage is that it doesn’t take as much work as other products demand. The manufacturer recommends simply applying it to your freshly rinsed hair and scalp, massaging it in and leaving it there until you’re ready to rinse off after your shower is finished. If you prefer leave-in conditioning, you can use a small amount of the same product on the ends of your just-cleaned hair while it’s still wet. The WEN by Chaz brand has hundreds of thousands of advocates online. It has garnered accolades from famous YouTubers, social media influencers, Hollywood stars, news outlets like the Huffington Post and Forbes, and style magazines. These fans come from many different walks of life. Interestingly, they all have notably different hairstyles yet still praise the product’s capabilities. 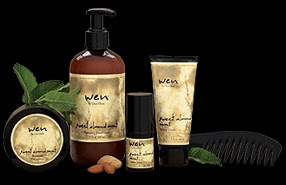 From making hair feel lighter and bouncier to overcoming tough tangles and dryness, WEN has plenty to offer. Could switching to WEN by Chaz be right for your hair? With features like 60-day money back guarantees and the promise of far more straightforward hair care, it seems like a solid bet. The creator's accompanying line of mousses, styling cremes and spa-grade moisturizers also make it fairly easy to upgrade your style routine along with your cleaning regimen. Hair texture depends on genes . To get smoothness use mild shampoos and conditioner after wash. Do not wash frequently and avoid blowers instead towel dry gently and don't brush wet hair. Exercise regularly and take nutritional food. Dont use chemicals and hair saloon treatment like straightening and perming. Hair spa too can cause damage on a long run.